RBC | The Rio Blanco County Republicans gathered Saturday in Meeker for their county assembly where two candidates for county commissioner sought access to the Republican primary ballot. 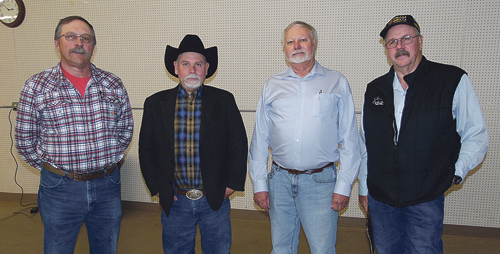 Meeker residents Gary Moyer and Mike Hoke were both nominated for the District 1 (central) county commissioner seat. Following nominations, seconds and speeches, Moyer received 46 delegate votes (88 percent) and will be on the June 26 primary ballot. 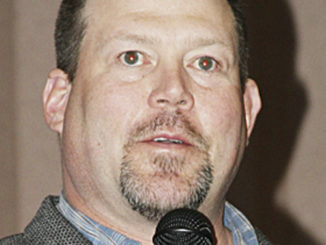 Hoke garnered 6 votes (12 percent) and plans to petition onto the primary ballot. Candidates need a minimum of 30 percent of the vote to be placed on the ballot by assembly and a minimum of 10 percent to be allowed to complete the petition process. Nominated by Terry Smalec of Rangely, seconded by Doug Overton of Meeker, Moyer told the crowd that in a county that is 75 percent owned by the government, “We need elected officials who will represent us well in Washington, D.C. Here in RBC, we have more interests in common with our neighbors in Utah and Wyoming than with the folks over the mountains who see our public lands as nothing more than a place to recreate when they wish to. They don’t understand multiple use or the need for limited government.” Moyer is a member and past president of the White River Conservation District board. Retired state patrolman Rob Baughman nominated Hoke, which was seconded by Vince Wilczek, Rangely Chief of Police. Hoke, who is retired from Colowyo, said that he’s seen young people and families have to pack up and leave Meeker due to lack of job opportunities, and he hates it. Hoke has been on the Pioneers Health Center and Foundation boards, and been a school bus driver in recent years. 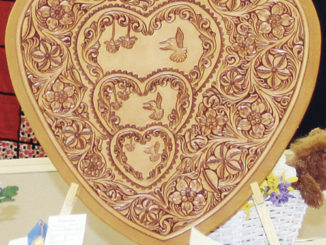 Appearing uncontested on the Republican ballot after nomination and approval by the delegates will be Renae Neilson for county assessor, Boots Campbell for county clerk and recorder, Laura Smith for county coroner, Anthony Mazzola for county sheriff, Rhonna Waldref for county treasurer, and Leif Joy for county surveyor. 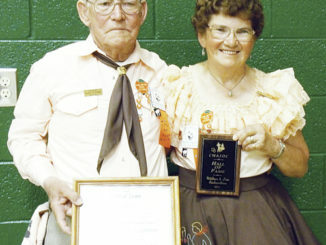 Neilson thanked the county Republican Party officers and especially her husband, Paul, stating that he has to endure her brain that doesn’t always turn off at night. She’s been pleased with the relatively low number of assessment appeals and her office’s success in dealing with over and under-reporting in oil and gas values. Campbell indicated her office has made a lot of progress in her four years, adjusting to the new voting system required by the Secretary of State. She’s also proud of the county’s new ballot drop box system and gives tremendous credit to her office team. Mazzola reminded the crowd that four short years ago he promised to put “serve” back into the “To Serve and Protect” formula, and to be fiscally conservative. He feels he’s done both. He mentioned that his office and others are currently discussing how school resource officers might better ensure public and school safety in both Meeker and Rangely. Long-serving county treasurer Karen Arnold is retiring at the end of her term. Terry Goedert, with Jeff Rector seconding, nominated Arnold’s deputy, Waldref to run as her successor. Waldref said that among her goals were getting the county able to accept credit card payments for the office and cross-training staff so that each could fill-in at any position. She hopes the number of foreclosures that she would have to facilitate as the public trustee would be low, that there have been only four so far this year vs. 41 in her first year. Joy was not able to attend the assembly, but conveyed his appreciation and desire to be re-elected surveyor by letter, which was read by assembly chair, Logan Hill. RBC Commissioner Shawn Bolton, who is ending his term as commissioner, thanked those present at the assembly for the opportunity to serve. 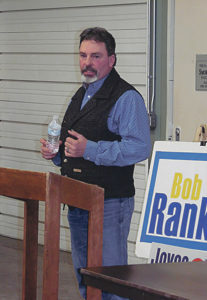 Bob Rankin was in attendance to stir up support for his House District 57 re-election campaign. Rankin celebrated the return of $18 million to Colorado of remaining Anvil Points oil shale clean-up funds and the long-delayed pay-out by the Department of the Interior (see Page 1A). Rankin is carrying the legislation to funnel that money back to our four northwest Colorado counties. He also urged the Republicans to turn out every possible vote this fall toward putting a Republican in the governor’s chair. He said one of his remaining goals in the legislature is to overcome the 1982 Gallagher Amendment which skews business property tax vs. residential property tax. Joyce Rankin, Bob Rankin’s primary aide and spouse, who currently serves on the State Board of Education, also spoke. She discussed school safety and the arming of teachers. She mentioned the Routt County sheriff’s plan to put armed guards in each of their public schools which she said would cost them $1.3 million, an amount most school districts certainly couldn’t afford. She said she’d like to make it a state requirement that schools teach civics again, stating that our students should have to know what persons wanting to become U.S. citizens have to learn about our government. Joyce Rankin will not be up for re-election until the fall of 2020. Moffat County Commissioner Ray Beck came down from Craig to speak in support of Brett Barkey, now the district attorney for Grand, Moffat and Routt Counties, who is running for state treasurer. Barkey, a retired U.S. Marine, lives in Hayden. The assembly elected delegates to represent RBC at the Colorado State Republican Assembly April 13 and 14 in Boulder. Those delegates will be Jeff and Rebecca Rector, Andy Key, Shawn Bolton, Anthony Mazzola, Terry and Ramona Smalec, Sam and Ginny Love, Konnie Billgren, Jennifer and Logan Hill. The county assembly came on the heels of the March 6 precinct caucuses where assembly delegates were elected for the purpose of choosing candidates for county office and selecting delegates to the State Assembly where gubernatorial candidates will be considered. Delegates to multi-county assemblies for naming state and federal House candidates were also designated. Retiring county commissioner Shawn Bolton gave some grateful remarks toward the end of the meeting, saying he had had a good time as commissioner and appreciated his opportunity to serve. Bolton, too, celebrated the long-delayed return of the Anvil Points dollars to RBC.